Russian American Cultural Center and Theater Of Russian Actors TRACT present: Author and director of the “Fourth Wall”, Theater Studio of political and theatrical satire. He has, as they say, long arms. Therefore, better come yourself. Otherwise we are not responsible for it. 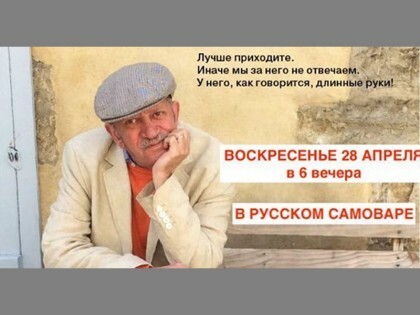 Russian American Cultural Center and Theater Of Russian Actors TRACT present: Author and director of the “Fourth Wall”, Theater Studio of political and theatrical satire. He has, as they say, long arms. Therefore, better come yourself. Otherwise we are not responsible for it.